One-sentence summary: A rambunctious retelling of James Joyce's life and work. Do I like the cover? : I do -- it's eye-catching and bright. First line: Once upon a time there was a man coming down a road in Dublin and he gave himself the name of Dedalus the sorcerer, constructor of labyrinths and maker of wings for Icarus who flew so close to the sun that he fell, as the apostolic Dubliner James Joyce would fall deep into a world of words--from the "epiphanies" of youth to the epistomadologies of later years. Buy, Borrow, or Avoid? : Borrow or buy -- this is an exciting, rambunctious read! Why did I get this book? : Edna O'Brien is a marvelous novelist, and I couldn't resist her take on Joyce. Review: I love writers on writers. O'Brien's biography of James Joyce is as boisterous and playful as Joyce's own prose. This is a reader's biography, full of fantastic vocabulary and mischievous, serpentine phrasing. Those familiar with Joyce's life will likely learn nothing new, but the passion and joy O'Brien has for Joyce makes revisiting his life exciting; for those new to James Joyce, this biography is a bit like baptism-by-fire. The reader is plunged in to Joyce's life with little explication of the whos and the wheres. Like reading one of Joyce's own novels, it is up to the reader to keep up. Joyce inspired O'Brien to be a novelist, so it seems a perfect fit for her to write a biography on him, but disappointingly, I found little of O'Brien in the narrative. Certainly, a passion for Ireland, a deep appreciation for the way the place kills and inspires, but very few 'I' statements that make clear her opinions. (I've gotten spoiled by biographies that allow the biographer to be present.) In some ways, this reads as a very long essay on Joyce and his works, but the style is very personable, very rambunctious, envisioning Joyce's thoughts and feelings with certitude. A quick read at 178 pages, this biography invites lingering and reflection, and of course, a look at Joyce's works. For fans of delicious language, this book is a must, whether one is familiar with Joyce or not! Just the other day I was asking for recommendations on GoodReads of good writers' biographies. This sounds exactly like what I was looking for! @Rhapsody: True -- I def think she got a seriously raw deal but I did like that O'Brien highlighted the sexual freedom Nora had with Joyce (not, like, free love freedom but not having to do the virgin/whore thing). Plus, I liked that she bemoaned the lack of Nora's diary -- she didn't seem to think Nora was unworthy of Joyce. @Alex: I recommend the Penguin Lives series -- I'm reading Jane Smiley's bio on Charles Dickens -- another fun writer-ly take on a writer. 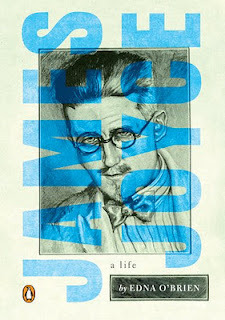 I am very intrigued -- I don't know much about Joyce's life at all. I love non-fiction, and definitely plan to pick this one up. Thanks for the great review! I haven't read much by Joyce (though it does seem like I'm the only one who enjoyed Dubliners) but I'm definitely interested in learning more about him. I think a shorter well written bio like this might be the way to go. @Col: This is marvelous literary non-fic -- I'd love to know your thoughts if you do read it! @Jenna: O'Brien uses a lot of Joyce's fiction to extrapolate abt his life, and Dubliners shows up a good deal. This was a marvelously fun book -- you should pick it up! This sounds like the biography for me. I want biographies told with enthusiasm. I have acquired a large stack of literary biographies (Hermione Lee's books are real doorstoppers), but I really NEED this one. It sounds marvelous and, at just 178 pages, I'm likely to read it sooner rather than later! I've been hoping this is a good book so I was thrilled to see how much you enjoyed it! It's a little odd that O'Brien didn't put herself into this book much if at all but maybe knowing Joyce inspired her to be a writer says it all. It's too bed Nora didn't leave a diary because I'd love to know her thoughts considering what Joyce put her through! I didn't realize this book isn't even 200 pages, wow! Fantastic review, Audra and I love your enthusiasm for this book! Yay! @All: I was hoping a giveaway copy would be available so I could really share the love, but alas, not so! @Blodeuedd: You crack me up! This is a pretty active book -- you might find his work sleep-inducing but O'Brien's playful and jumpy! @O: I hope you can get a copy -- this is a marvelous, snappy read! @Serena: I've read a few reviews that said the reader for the audio version leaves something to be desired, which is too bad, because this really is an exuberant, enthusiastic book. @JoAnn: I love Lee's books for that reason but this book reminded me of the value of something slim -- bigger isn't always better! I'd love to know your thoughts if you do pick this one up! @Amy: thank you -- if you pick it up, let me know what you think -- it's a treat for word lovers! I have this book, and have hesitated on reading it because I have never read Joyce and was afraid I would be lost. I might have to give it a go though. You make a really great case for it!